Arizona Cardinals running back David Johnson will be out weeks with a wrist injury. If that ruined your fantasy football team, here are five replacements. Things did not go well for the Arizona Cardinals in their first game of the 2017 NFL season. 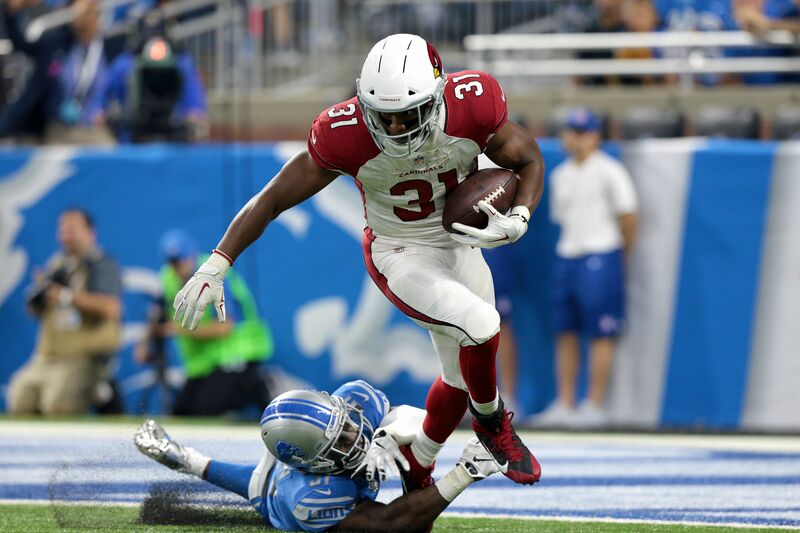 Not only did they look ancient in their bad loss to the Detroit Lions, but the Cardinals will be without their best offensive player in running back David Johnson for some time. Johnson is seen as one of the three best running backs in football. He is adept between the tackles, shifty out on the edge and an excellent receiver out of the backfield. Unfortunately, he suffered a bad wrist injury in the opener and could miss up to three months of time for the Cardinals. Sorry to all you fantasy football players that took Johnson No. 1 overall or in the top-five. I would have taken him No. 1 in my league, but that’s what happens when you end up with the No. 4 overall pick. Those that took Johnson are left searching for answers. Who should be worth picking up in the wake of his devastating injury to your fantasy team? Replacing Johnson’s production will be next to impossible, but maybe you can get great value in the flex with a tailback that might still be available in your league. Here are five names to consider as you try to tread water until Johnson comes back in the second half. We’re really reaching here, but maybe Lions’ third-string running back Zach Zenner could be a good play for you down the road. He was the guy that Detroit leaned on last year once all the weapons in Detroit got hurt like Matthew Stafford’s finger. Of course, Lions head coach Jim Caldwell will want his running game to be centered around Ameer Abdullah and Theo Riddick. However, Abdullah hasn’t been as good coming out of Nebraska as advertised. He was the guy that Arizona actually wanted over Johnson in the 2015 NFL Draft, but he was already off the board. Riddick has had his issues with injuries as well. What might make Zenner a good play is that the former South Dakota State Jackrabbit can be an effective runner out of shotgun. Detroit will expect to sling it with Stafford in the middle of his prime quite a bit this year. Maybe Zenner can get you some points in PPR leagues? Don’t expect to lean on Zenner as your bell-cow fantasy back this year. In fact, he was inactive Week 1 versus Arizona. If you didn’t draft a few other running backs to complement Johnson, it’s your fault for being dumb. However, Zenner could be a halfway decent play in the flex some weeks, especially if the Lions succumb to the injury bug like last year.